Nearly 60% of vehicles in some parts of Bradford are not insured, new figures have revealed. The city has the worst record for uninsured drivers in Yorkshire, and one of the worst in England. The Motor Insurers' Bureau (MIB) said the BD3 postcode area had 4,403 uninsured vehicles, which equates to 57.3% of all vehicles in that area. 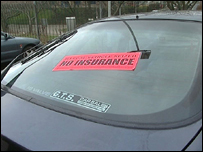 West Yorkshire Police are targeting uninsured motorists during a month-long crime crackdown. As part of Operation Maximum Impact, police are using Automatic Number Plate Recognition equipment to identify vehicles that are not insured. Sgt Paul Richardson said: "There is no compromise whatsoever. "It's an absolute offence to have no insurance and if you are caught driving on the roads of West Yorkshire you will have your car seized and you will either be issued with a £200 fixed penalty notice or find yourself appearing before magistrates." The BD3 area of Bradford includes Barkerend and Thornbury. The MIB said people were six times more likely to be hit by an uninsured driver in that postcode area. The BD8 area of the city, which includes Manningham and Lower Grange, is the second worst offender, with 42.7% of vehicles uninsured.